Chelsea star, Eden Hazard has stated that he ‘cannot be happy’ at the club unless the Blues are winning and challenging for trophies. Antonio Conte’s men, who currently sit on fifth position in the Premier League table, have struggled to produce consistent performances this season. The Blues are currently five points behind fourth place, Tottenham in the English topflight log. The Premier League champions will be hoping to overtake Mauricio Pochettino’s men in the race for Champions League qualification for next season. 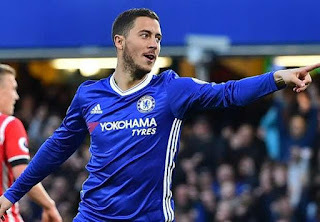 Hazard has insisted that no matter how well he is performing for Chelsea, he cannot be satisfied if the team is not winning matches and challenging for trophies. Speaking to Metro, Hazard said: “Yes I have scored some goals – that’s why I am on the pitch – but the thing I want most is for my team to win. “When we are not winning, I cannot be happy. We are fifth in the Premier League and we are out of the Champions League. We didn’t win the League Cup. So it is a bad season.